We’ve all been to blasé get-togethers where individuals conspire to sell you something or overeager business types push business cards into your hand saying “give me a call”. 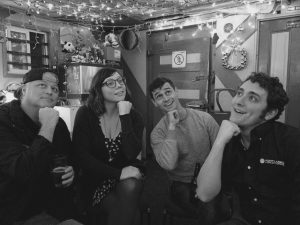 This is in no way the Portland Internetworks Mid-Month Meetup, and we want to tell you our meetup’s origin story to prove it. 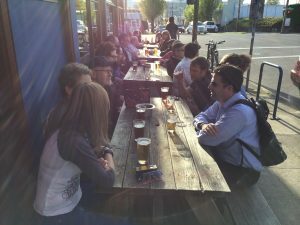 When we started our after-work gathering 15 odd years ago, it wasn’t the networking happy hour that it is known to be now. When it began it was a simple way for our small team of about 10 at the time, to blow off steam when the work day was over. 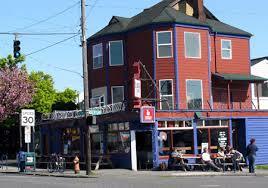 It was always held at the well-known Eastside dive bar, The Slammer. Our people would head over and enjoy a few drinks, laugh, but most importantly everyone would be together. It was often referred to as “Taco Tuesday” although the event was usually on Wednesdays, and no one ever had the tacos. To be fair, the bar’s reputation revolves around the cheap drinks and unique atmosphere, not the cuisine. We may have never tried the tacos but we did share many a good time at that bar, as a team. The meetup was an in-house happy hour to begin with, just serving as a culture builder for our people. Over the years it became a night for our friends, new and old, to come together and spend quality time, not just the PDX.net crew. What changed was, we started taking on clients that were so great during work hours, we wanted to share a cold beverage with them after the workday was done. It was simply an excuse for us to get together, as a team, as friends as business partners. What is the Goal Of The Meetup Now? To provide value to the Portland Community. The event’s focus is centered around the amazing people and businesses in our area. Every month we host our meetup and open it up to anyone that wants to come. Since our organization has grown, we’ve also started rotating venues. This variety helps us gather with our friends on both sides of the river and help establish connections and network in their neighborhoods. Our meetup has done so much for our culture and organization: It has helped develop new business relationships for our clients. It has allowed us the opportunity to meet stellar employee candidates. It has given us the chance to develop deeper relationships with the companies with whom we provide IT services. The meetup has done more for our network and our team than we could possibly cover in a single blog post. With how much our events have done w to continue providing value to the community through our events. Join us for a meetup and see for yourself the positive atmosphere we have created for our people. Something to Check Out In The Neighborhood! Spreading the Word: Portland Internetworks is Presenting!